She works beautifully! It took a buddy and I about 20 minutes to figure out the networking setup so I could use the ethernet port instead of USB, but it worked perfectly first shot after we got that sorted. Want to run RetinaEngrave but don't have a PC? Want to run it in a virtual machine with an ethernet connection instead of a dodgy USB connection? Read on. First get the networking going in Windows in Parallels so you can get to the web with a browser. This is easy as it just works after install by default as long as the connection on the Mac side is fine. Plug up the ethernet cable from the laser to the Mac, making sure the laser is off. Go to the Parallels settings -> Hardware -> Network and make sure it looks like this. Your MAC address will be different obviously. Now go to the Sharing Preference panel in OS X and turn on Internet Sharing. Share your connection from Wi-Fi to computers using Ethernet. This was the magic bullet we couldn't figure out for a while. 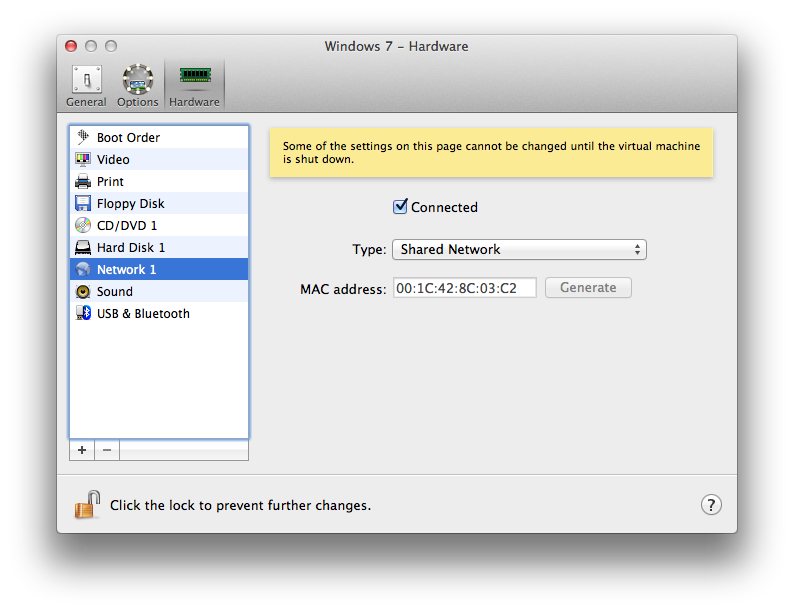 This allows the mac to share the WiFi connection and the ethernet port with the virtual machine at the same time. If you are using ethernet on your Mac to connect to your router... god help you. Actually... kidding... that should be much easier, just plug the laser into the network via a switch and you should be good to go without this last step. This worked great for me, your mileage may vary. Now when I start up the Laser it pulls 192.168.2.2 from the local network, and RetinaEngrave sees it quickly. It registered and all was well with the world. I will assign it an IP when I get over my fear of changing something that works unnecessarily. I grabbed the handiest vector file I had laying around from a logo I designed for Squirrel Wingsuits, loaded it up in Illustrator, and clicked print. RetinaEngrave got it, I scaled it, turned the power down to 10% and hit print. The stroke was 1pt in Illustrator, which it turns out makes the laser do two passes on the line as that's relatively thick. Next try was at .5pt and it was much better. Then I adjusted the head focus... even better. Then scaled it up and went to 75% power and it made the beautiful cut you see to the left. Awesome. The precision is nuts. We then tried a raster image at 4% power and again, impressive precision with micro perforations on the cardboard surface. 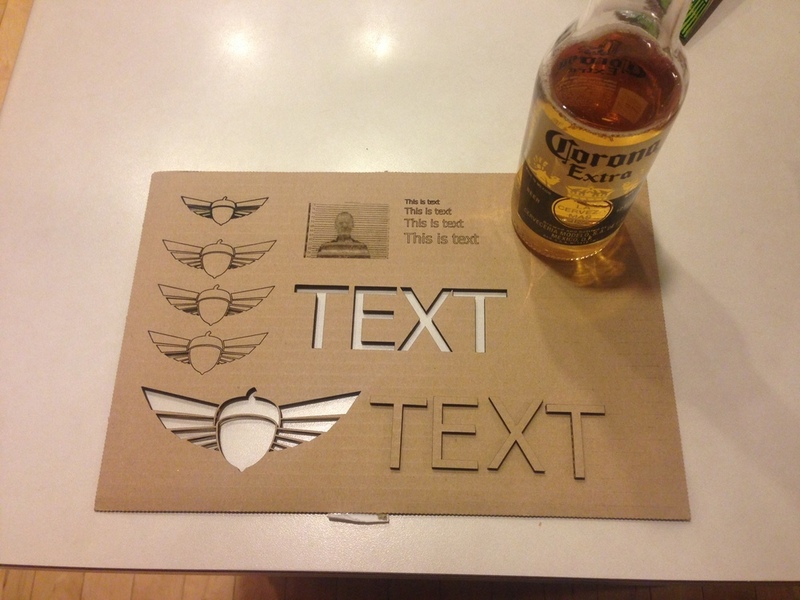 Then some text. Works beautifully. Beer to celebrate! Very very impressed with this thing. I can't wait to start some creative projects with it very soon. Side note: I got a call back this morning from the message I left yesterday about the red diode being a line not a dot. So one day call back time. Again, not bad for a company that is shat on all over the forums for having horrible customer service. I was worried, but am now very stoked with my decision to go with FSL. Posted on March 5, 2013 by loren cox and filed under Laser and tagged ethernet FSL 40W 5th Gen Laser laser mac networking osx parallels.